Based in West Bromwich, we provide professional squirrel humane trapping services across Birmingham, Sandwell, and Walsall. The nest of the Grey squirrel is called a drey. Normally made from twigs, dry leaves and grass, in roof spaces insulation is often used. Squirrels are diurnal, active from before sunrise to after sunset, and females are pregnant for around one month and produce a litter of three to four kittens. Squirrels’ front incisors constantly grow and thus require filing; this is achieved via gnawing. Unfortunately they do not discriminate about the material they chew. This can cause problems if they are living in a roof space where wires (fire hazard) or the structure can be damaged. Grey squirrels are considered vermin and are therefore not allowed to be released elsewhere. It is also considered to be cruel to relocate them as they will be attacked by territorial squirrels living in that area. In many areas council pest control will not cover squirrel problems and so using a private professional company is recommended. 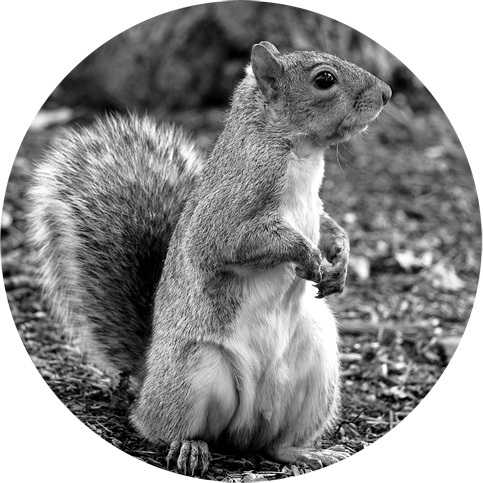 To discuss your specific problems involving squirrels or any other type of pest control please call us.